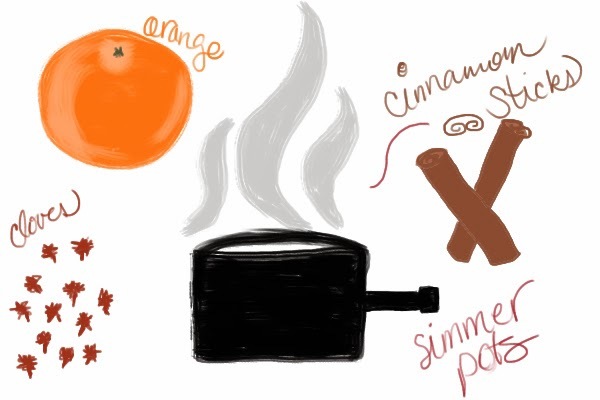 Simmer pots are the best way to cleanly fill your home with a scent that doesn't come from a candle. I love making them when the house starts to smell a little musty. It's clean, it's fresh and this recipe that I love is reminiscent of the holidays. For some reason, oranges remind me of Christmas. I know most people are reminded of summer and warmer weather when they slice open an orange, but not me. I remember making a cinnamon-clove-orange ball for decoration that smelled so magnificent when I was a little girl. So I recreated that scent with a simmer pot. It's so easy to do at home, especially if you have these three ingredients in your pantry. I use cinnamon sticks if I have them or a tablespoon of ground cinnamon if I don't. I typically use ground cloves as well simply because that's what I have. I try to save an orange for simmer pots when I get them, so that I can grind the orange in the disposal to smell nicer and put the peels in the pot. Bring a small saucepan filled with water to a boil (more if you want it to last longer, keep adding if it goes down, which it will), add in your desired ingredients, let it boil for about five more minutes, then turn to simmer and go on about your business. You'll be smelling the sweet scent in no time and won't even have to burn a candle. My husband smelled it the other day and asked if I was making something special. He was a little disappointed when he discovered he couldn't eat it. If you want more recipes, Apartment Therapy has some great options for you as well.